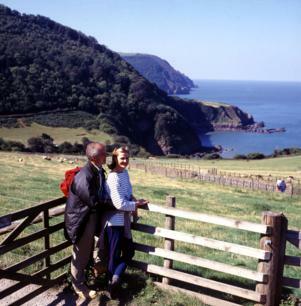 Today is spectacular throughout and one of the finest stretches of North Devon Coast Path. 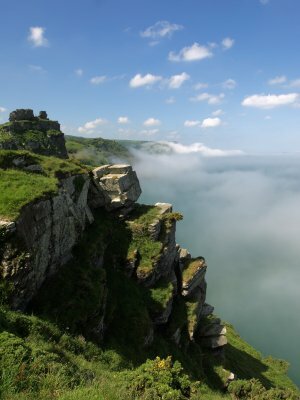 A steep climb from Lynmouth opens into cliff walking through the infamous valley of the rocks before a contrasting stretch of moorland below Trentishoe and Holdstone Down on route to the long ascent of Great and Little Hangman. Start the day on the 19th Century water powered cliff railway to reach the North Walk (a throwback to the Victorians obsession with promenades) and the entrance to the magnificent Valley of the Rocks. Dumped by the Ice Age “a huge terrifying reeling mass – the very bones and skeleton of the earth” was how Poet Robert Southey described it. Huge Tortuous Twisted and contorted rock formations, pass the Devils Cheesewring, Ragged Jack the Cave of Mother Meldrum and the White Lady to lead you on past Castle Rock which proudly stands towering over precipitous drops to the sea. In amongst the rock towers and formations the mysterious air is fuelled by the packs of wild goats bounding around the desolate scene. Past Duty Point Tower, Lee Bay Abbey and the Red Deer at Woody Bay before the South West Coast Path enters the steep sided and dramatic ravine of gorse and scree at Heddons Mouth one of the deepest valleys in the UK. There is a good inn and the Heddons Gate Hotel here for those that want to break this section and spend a night above this stunning valley. Divert to the isolated Hunters Inn at the head of this most dramatic of ravines –(these days the coaching house also has a welcome National Trust Ice Cream Parlour) as you have now have a challenging 900ft switchback climb to the dramatic rocky scree platform and viewpoint at Peters Rock. Up here raven, buzzard, kestrel, peregrines and sparrow hawks glide and swoop past Bronze Age Hut Circles last used over 2,500 years ago. You now start the big climb through gorse and heather moorland up to the imposing humpback of Great Hangman its cairn at 318m (1043ft) the highest point on the whole 630 miles of the South West Coast path and the reward being the best views over Exmoor yet. Locally said to be named after a sheep thief who strangled himself having tethered his stolen ewe around his neck there is also evidence of a Gallows up here in this desolate spot in Tudor times. Up in the heights you will pass disused mine workings along the old miners track from where the ore was dropped hundreds of feet over the huge cliffs to the shore below to for loading onto Welsh sailing boats. It’s then a long but welcome descent over the lesser lump of Little Hangman all the way back to sea level at Combe Martin.